"Think outside the box" or you can just get rid of the box all together! 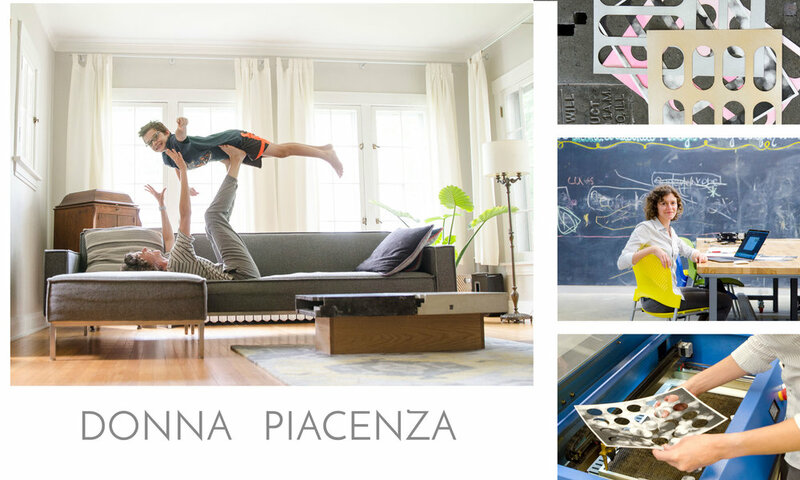 Meet Donna Piacenza, creative wonder woman who produces one of a kind functional pieces for home decor, fashion, and beyond. Her pieces have been produced and sold through companies such as CB2, as well as through her own brand name. When I wanted to start this "work love balance" project, Donna was actually one of the first working mamas I thought of. Her peaceful demeanor does not give away the incredible amount of creativity and engineering power that inhabits her. When we get together, it never fails, we sit and talk about creative projects we could take on. She is the most encouraging person. Encouragement is powerful. I truly love that about her. I'm sure more creatives do too, because you get that "there's someone out there like me" feeling. Donna, married to Mike, and Mom to Edie and Alma ~ two beautiful little girls, with the same creativity power. Donna's Dad owns a machine shop in Illinois giving her the experience of operating equipment. This is a one up amongst the boys when you enter any 3D shop class in college! I had the pleasure to work with Edie during our shoot, the winner of an incredible award from PlayMonster. She created and will soon be producing her very own board game! And instead of boasting or bragging about her big win, she danced around with her giant check she was awarded and made the most perfect kid faces. Then I got a sneak peek of her dessert sushi she was preparing for her family for after dinner. Creativity flows through this household. Hey Edie... I will be over to taste test the sushi! Here's a bit more about Donna, you might see her out running with Elmhurst Running Club or testing out new concepts in the Elmhurst Public Library Makery. I like to hang out with people that are not usual. Creative people, and I believe everyone is creative, inspire me when they look at the world with a unique perspective. Whether it's through photography, sculpture, fashion, metal work, painting, etc., I'm inspired by those who put a new spin on any project. Donna's advice to those entrepreneurs who might be waiting for that perfect time to start. Donna is pictured in the Makery in the Elmhurst Public Library, offering career and technical machinery, printers and more for the most creative minds to be set free in! I started my business about 3 years ago. I love the flexibility to work on my schedule. It helps me fit in time with my family, while still being productive in my own career. This way, I get to pursue the clients I want and explore new directions in my career path. I critique every one of my own projects endlessly but I'd have nothing to show for myself if I didn't put work out there. What type of training did you do to master 3D design work? education or hands on? I went to school for Industrial Design and always loved hand-making prototypes. Intuitively *listening* to where forms, materials and surfaces want to go in space, really informed, and continues to define, my aesthetic. Quick, paper mock-ups are my favorite. I try to exercise in some way every morning. I'll run, bike, swim or practice yoga - as long as I'm there with friends, it keeps it fun and puts me in the right mental state for the day. What would be your dream client to work with on a project? I like to work with anyone who is eager to try something difficult-a new material or process or even better an old one in a new way. I really admire designers that push materials, manufacturing and concept like Hella Jongerius, Patricia Urquiola and Ray Eames. And creatives like you, Dana, that produce, produce, produce!